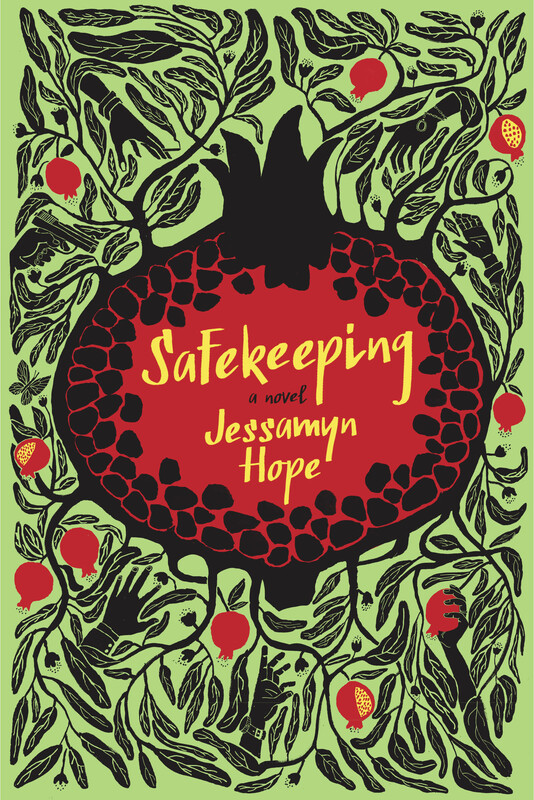 BEDFORD, NY (June 9, 2015) — Safekeeping (Fig Tree Books; June 9, 2015; original trade paperback; $15.95) by Jessamyn Hope is an expansive and affecting debut novel about love, the inevitability of loss, and the courage it takes to keep starting over. Set against the backdrop of Jewish history, Safekeeping explores human perseverance through the stories of six troubled characters whose lives intersect one summer on a kibbutz in Israel. At its heart stands an object: a mysterious sapphire brooch with a fascinating and perilous backstory spanning three continents and seven centuries. It is 1994 and Adam, a drug addict from New York City, travels with the medieval brooch to Kibbutz Sadot Hadar, where his late grandfather lived fifty years prior as a Holocaust refugee. Desperate to redress a past crime, Adam must give the priceless family heirloom to a woman his grandfather fell in love with on the kibbutz. But first, he has to track this mystery woman down—a task that proves more complicated than expected. On the kibbutz Adam joins other lost souls trying to turn their lives around: Ulya, the ambitious and beautiful Soviet émigré; Farid, the lovelorn Palestinian farmhand; Claudette, the French Canadian Catholic with OCD; Ofir, the Israeli teenager wounded in a bus bombing; and Ziva, the old Zionist Socialist firebrand who founded the kibbutz. Driven together by the confines of the kibbutz, by love and hate, by their irreconcilable dreams, and by a shared sense of insecurity, the fates of these six people become entangled as each gets one last shot at redemption. The complex and powerful themes Hope weaves throughout Safekeeping are drawn from her own life. Through her intricate characters, she explores the yearning to belong somewhere, a feeling she is familiar with, having grown up in Montreal with an Italian-born mother and a South-African father, and then living in Israel before settling down in New York City. She vividly captures the experience of coming of age in a pre-9/11 world and the expectation of many at that time to inherit a world that was only going to get better, while the tragedies that lay ahead haunt the novel. Through Claudette, she reveals what it’s like to suffer with severe OCD, going beyond the well-known hand washing to show the torment inside the mind. She drew on her experiences of living on a kibbutz to explore the allure of individualism versus the pull of community. And as in real life, everyone in the novel endures loss, and Hope drew on the grief of losing her mother in her early teens to examine how people carry on after tragedy to build lives of love and meaning. Safekeeping is an enthralling, insightful, and multi-layered story that diverges and comes together, keeping the reader spellbound and curious. About the author: Jessamyn Hope’s fiction and memoirs have appeared in Ploughshares, Five Points, Green Mountains Review, Colorado Review, Descant, and PRISM international, among other magazines. A chapbook of her personal essays was published by Peter Cameron’s Wallflower Press (Fall 2013). She was the Susannah McCorkle Scholar in Fiction at the 2012 Sewanee Writers’ Conference, has an MFA in creative writing from Sarah Lawrence College, and teaches writing at GrubStreet. Originally from Montreal, Jessamyn now lives in Brooklyn, NY. Learn more at www.jessamynhope.com. About Fig Tree Books: Fig Tree Books sources, publishes, and promotes literary, young-adult, and graphic novels (in print and e-book formats), as well as memoirs that chronicle and enlighten the unique American Jewish Experience (AJE). The Company accomplishes this in three ways: (1) by selecting new voices that have not had the opportunity to publish previously in these genres; (2) by working with previously published authors; and (3) by re-publishing important works that have gone out of print.